Can India ever have car-free centres? Whereas European cities are making an effort to return to walking and cycling through innovative ways of pedestrianisation and car-restraint policies, the tradition of cycling and walking is being squeezed out of Asian cities. Only Japan and Singapore are making some efforts to revive these practices. In Chinese cities, where non-motorised transportation can still cover up to 80 per cent of total daily trips, wrong transportation policies are edging them out. This policy neglect is most obvious in Indian cities that are now in the deadly grip of killer fumes and noise. Since non-motorised modes are seen as a symbol of backwardness, infrastructure development is planned only for cars and other motorised transport. This is leading to fast deterioration of road conditions for cyclists and pedestrians. Roads are more dangerous for them and not enough space is left to accommodate them. Delhi, the capital city, is an excellent example of mindless traffic planning. Apart from feeble gestures to get a plan for bicycle tracks or pedestrianise a few shopping malls in Delhi, nothing much has really happened. Only after the Supreme Court ( sc ) began to mount pressure on the Delhi government to take action to control vehicular pollution, the Union Ministry of Environment and Forests issued a White paper on the state of Delhi's pollution in December 1997. The White paper proposed for the first time a "provision for bicycle tracks and greater use of existing tracks" and the responsibility was assigned to the traffic police department to implement it by April 1, 1999. The Environment Pollution Control and Prevention Authority ( epcpa ) responsible for monitoring of the sc orders found no action was taken on this count. All proposals for exclusive bicycle paths are buried in files. Transportation Research and Injury Prevention Programme ( tripp) , spearheaded by a team of transportation planners and engineers in Indian Institute Technology, Delhi, has prepared a bicycle master plan for Delhi. This master plan, submitted to the Delhi government, brings out detailed design solutions for the existing roads to improve flow of all modes of transport including the non-motorised mode. But action is missing in this direction too. Yet there is an immense potential to create car-free zones in Delhi. When members of the Central Road Research Institute in Delhi surveyed the traffic pattern in Delhi in 1990, they were amazed to note that bicycle usage in many parts of Delhi was still very high. It was as high as 48 per cent of the total traffic flow in gt Shahadra road in east Delhi, 45 per cent on Madangir road in South Delhi, 45 per cent in Loni road in east Delhi and so on (see box: The josh machines ). The proportion of bicycle traffic is more than 30 per cent of total traffic during peak hours on many arterial roads. 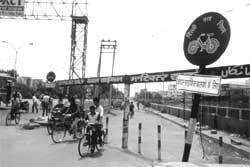 On one of the major highways (Rohtak Road), cycles constitute 43 per cent of the total traffic during peak hours. Even today, Geetam Tiwari of tripp estimates that 25 per cent of shopping trips, 15 per cent of the trips to work, and 50 per cent of the trips to schools can be undertaken by bicycles. Though the share of bicycle trips has declined over the years, it is not certain whether the absolute number of bicyclists have reduced. A large number of commuters still cycle or walk along the inter-city highways with comparatively long trip length -- but in this case due to inadequate mobility options. Lack of support from the state government coupled with hostile traffic conditions, middle class disdain, and lack of infrastructure support, is increasingly depriving bicyclists of their driving space.Motorised vehicles are crowding them out. While in 1957, the bicycle transport in Delhi met 36 per cent of travel demand, it declined to 17 per cent in 1981 and then drastically to just 6.61 per cent in 1994. Share of bus has steadily increased meeting almost 62 per cent of the travel demand (see table: Road nonsense ). Though the number of cars have increased dramatically, their importance in meeting travel demand is not as much as two wheelers and buses. In fact their share has declined. This means there are more cars on road meeting lesser travel demand. The average trip length for bicycles has dropped marginally from five km in 1957 to 4.89 km in 1994 but that of motorised transport has almost doubled during the same period indicating greater intensity of automobile use. It, therefore, makes a lot more sense to set aside road space dedicated to cycle use. tripp estimates that a 3.5 m lane has a carrying capacity of 1,800 cars per hour but the same lane can carry 5,400 bicycles per hour. This means if the same number of cars were to be accommodated, three times more road area would be needed. The bicycle master plan as proposed by tripp estimates that bicycle lanes can increase road space availability to motorised transport by 50 per cent on three lane roads. In the absence of a segregated bicycle lane, the cyclist in Delhi uses the curb-side lane (the lane to the extreme left). If a separate lane is constructed for bicycles, then the curb-side lane, will become available to motorised transport, creating more space and reducing congestion. The curb-side lane, which is mainly used by bicycle traffic and other non-motorised vehicles at present is 3.5 metre wide. But a bicycle lane would need a lot less -- only 2.5 metre. According to tripp study, the most dramatic profile of the Delhi traffic is that for all modes of transport a very high proportion of trips are in the distance range of less than five km. In fact, as the study indicates, 30 per cent of all bus trips, 44 per cent of all scooter trips, 60 per cent of all three wheeler trips, 33 per cent of car trips, 43 per cent of taxi trips and 71 per cent of all cycle trips are under the five km range. Thus a staggering 2.2 million trips in Delhi have the potential to be converted for bicycling and thus reduce congestion and pollution. There is a great scope for promoting bicycles in schools. The Delhi High Court order which restricts admissions to schools within an eight kilometre radius provides an opportunity to convert a great proportion of trips to school to cycles. Geetam Tiwari estimates that even today nearly 50 per cent of school trips can be on bicycles. But, not many schools are conscious of this. When questioned, the transportation department of Tagore International School told Down To Earth that they had never given any thought to such an idea. Only a few like Mother's International School have taken a conscious decision of encouraging admissions from a very close radius so that students can walk to school. Those who walk to school are given a seperate walker badge. But the over-riding concern for most schools and guardians is how to ensure road safety if cycling is encouraged. Only dedicated bicycle paths can help to build confidence in cycling in the city. If this is ever achieved, it would allow for a real change of traffic flows, reducing the number of cars, the growing need for new roads and parking plots, the sealing of open spaces and the emissions. Holiday resorts discover the added value a car-free surrounding can offer and stop private cars outside the city limits. Car-free city may seem like an utopia today only because of the lack of imagination of citizens, politicians and planners who are used to car. To provide them with visions, existing projects can be models or pioneers, hopes Loose. The experiences gathered will help to convince city planners, councillors and developers to give more projects a chance. Because they prove, that there is life in the city even without a car.